Isolation, Screening and Identification of Terpene Resistant Microorganisms from Decayed Yellow Orange Citrus Fruits. Novel terpene resistant microbial isolates were obtained from decayed yellow orange citrus fruits (Citrus reticulata) collected from distant locations in Navi Mumbai fruit market. A total of nine microorganisms were isolated and coded as 24B1, 48B1, 48Y1, 48Y2, 48Y3, 120Y1, 120Y2, 2WY1 and 2WASP. Terpene resistant microbial isolates were screened by checking their growth in increasing concentrations of monoterpenes, limonene and alpha pinene. Five strains, 24B1, 48Y2, 48Y3, 2WY1 and 2WASP were selected by their resistance to terpenes in yeast malt broth in primary screening. Subsequently, three strains, 24B1, 48Y2 and 2WASP were selected upon their capacity of using these terpenes as sole carbon source in mineral media in secondary screening .Hence the above three isolates may be further processed to retain their activity in degrading terpenes to produce valuable aromatic chemicals. Decayed yellow orange citrus fruits, Microbial Characterization, Terpene resistant novel Strains. Aromas and fragrances incorporated in food, perfumes and cosmetics have high value in the world market, leading towards the selection of species commercially cultivated in quantity and quality of volatile substances. Currently most flavoring compounds are produced via chemical synthesis or extraction from natural materials [1-3]. However, recent market surveys have demonstrated that consumers prefer products labelled as natural. In recent years, there has been a growing demand for flavourings from natural sources. The use of microorganisms may offer an alternative method for producing natural flavor and fragrances . The industrial production of aromas corresponds of 25% of the food additives world market . Besides that flavors present additional sensorial characteristics, antimicrobial activity, antioxidant activity, and anti-inflammatory properties, fat reduction and arterial Pressure regulation . With more than 22,000 individual identified compounds, Terpenes represent the largest group of natural flavor products widely distributed in nature.Terpenes are secondary metabolites of plants that are produced, in part, as a defense against micro-organisms and insects. The simpler terpenes (mono- and sesquiterpenes) and terpenoids are the major constituents of essential oils and are widely used in the flavour industry. They may be incorporated in the formulation of foods, cosmetics, hygiene and household products, acting not only as flavourings , but also as antibacterial agents . In this perspective, the interest in such compounds is constantly growing. Biotransformation of terpenes represents a very attractive alternative for the production of aromas , because it takes place under mild conditions, does not generate toxic wastes, and allows producing "natural" aromas that can be used as fragrances and flavors in the industry . Monoterpene precursors can be converted into their more valuable oxygenated derivatives. Among monoterpenes, R-(+)-limonene and α-pinene are the most widespread in nature and are largely employed in fragrance and flavour industries. These two monoterpenes have been used as the main precursors for the synthesis of their oxygenated high value products. α-Pinene (Figure: 1A) one of two isomers of pinene is an organic compound of the terpene class, it is an alkene and it contains a reactive four-membered ring. α-pinene is the bicyclic monoterpene hydrocarbon of low price and is a component of the wood and leaf oils of a wide variety of other plants and citrus fruits. Some of the biotransformation products of α-pinene are verbenol, verbenone, sobrerol-d , α- terpineol, limonene , pinocarveol, pinocarvone, myrtenol, myrtenal . d- Verbenone & verbenol are used as insect repellant, in perfumery, aromatherapy and as food flavouring. Highly pure sobrerol-d is used as a balsamic and a respiratory analeptic. Myrtenal has spicy and woody flavor. In recent findings it is concluded that myrtenal exhibits excellent free radical scavenging activity and anticancer activity through the suppression of hepatocellular carcinoma in wistar rats which gave positive insight to take this compound as an effective therapeutic agent against hepatoma . D-Limonene, which is the (R) - enantiomer (Fig: 1B) is the most abundant monocyclic monoterpene in nature and represents more than 90% of orange peel oil. Some derivatives of limonene are alpha-terpineol, perillyl alcohol, carveol, carvone and menthol [15,16]. Besides their desirable aromas, some of these oxygenated derivatives not only prevents the formation or progression of the cancer but, also regress existing malignant tumours . More than 50,000 tonnes / year (+)-limonene and over, 160,000 tonnes /year α-pinene accumulate worldwide as major by-products during citrus oil and wood processing, respectively. These monoterpenes represent an ideal starting material for bio catalysis because of their almost unlimited availability. Many species from prokaryotes to higher fungi have been shown to be capable of transforming terpenoids, by catabolic breakdown. Hence screening of microorganisms is of particular interest which may be able to catalyze a specific reaction of interest. Considering the main problems involved in biotransformation processes like chemical instability the low solubility of precursor, the high volatility, cytotoxicity of both precursor and product and the low transformation rates , a good screening of terpene resistant strains is been one of the most critical steps for choosing an adequate biocatalyst. Considering the vast applications of the terpenoids and the scope to research for novel sources of terpene degrading microbial isolates, the present study has been carried out to isolate and characterize the terpene resistant microorganisms from decayed citrus fruits. As orange fruits are rich source of terpenes where it is believed to have strains more adapted to terpene containing environment, the decayed yellow orange citrus fruits were used to isolate the novel strains that may be used as a part of the microbial pool for the production of aromas from terpenes. In the future, the selected strains might be evaluated for their biotransformation capacity to produce valuable aroma compounds. Many studies have been performed recently in terms of production of aromas using terpenes, resulting in wide variety of products [19-23]. Two monoterpenes R-(+)-limonene, (97%,-Aldrich), α-pinene (>98%, Fluka) were used as substrates. The reagents were used without any pre-treatment. All other chemicals or solvents were of analytical grade. Decayed mandarins were collected from distant locations of Navi Mumbai fruit market, and brought to R&D lab, Privi organics ltd, Navi Mumbai. Collected samples were stored in aseptic packing until the moment of the analysis and processed further for the isolation of microorganisms. Isolation methodology is based on Ieda et al . Samples were serial diluted, and inoculated in petridishes containing potato dextrose agar (PDA) and incubated at 30°C for 24hrs to 2 weeks. Random subculturing is done after respective incubation periods. After the growth of the isolated microbial colonies, they were sub-cultured to plates until the complete isolation of the pure microbial isolates. Colonies were transferred to agar slants with PDA medium (for filamentous fungi) or Yeast malt agar (YMA) media (for yeasts and bacteria) and incubated at 30°C for 48 h. selected cultures, after growth, were stored at 4 °C. Cultures were codified to facilitate future identification. The purity of the strains was verified by microscopic examination. The characterization of the microorganisms was carried out using selective medium for bacteria and yeast. The selective medium for bacteria is prepared by 100 ml of plate count agar (PCA) with composition 5.0 g/L of tryptone, 2.6 g/L of yeast extract, 1.0 g/L of glucose, and 15.0 g/L of agar), 500μl of nystatin (100 U/mL), and the selective medium for yeast is 100ml of PCA with 50μl of chloramphenicol (52.5mg/ml). Bacteria and filamentous fungi were identified by Gram staining and micro-cultivation techniques respectively. The identification of the fungi genus was based on the morphology of colonies and on the fructification structures of the strains following the key of research of genera . The pure colonies of microorganisms isolated were transferred aseptically with a loop to Erlenmeyer flasks containing media. Yeast and malt extract (YM) medium was used to prepare the inocula for the bacteria and yeasts with composition, (1% glucose, 0.5% peptone, 0.3% malt extract, 0.3% yeast extract. 2.4% PDB is used for fungi and incubated at 30ºC for and 275rpm. The terpene resistant microorganisms were selected based on Ieda et al [21 & 25]. The culture medium containing limonene / alpha pinene is used to test the resistance of microorganisms in the presence of terpenes. Each inoculum of 100μl was transferred to 100ml Erlenmeyer flasks containing 10ml of YM /PDB medium. The concentrations of terpenes added were 0.2%, 0.5%, 1%, and 1.5% v/v each. The cultures were incubated in rotary shaker at 30ºC and 275rpm for seven days and were compared to the control sample, which did not contain terpenes. Growth patterns were determined for seven days in terms of absorbance at 660 nm for yeasts and bacteria whereas the biomass was filtered and quantified by wet weight for the fungi. In succession, all the strains considered resistant from above test were evaluated for utilization of terpenes as sole carbon source. 100μl of the above resistant screened cultures were inoculated in 10ml of mineral media. Terpenes were added at 0.2%, 0.5%, 1%, 1.5% v/v each as sole carbon source. The media components contained; (NH4)2SO4: 5.00g/L; KH2PO4: 0.9g/L; Nacl: 0.50g/L; MgSO4.7H2O: 0.40g/L; Cacl2: 0.60g/L; Kcl: 2.15g/L; FeSO4.7H2O: 0.01g/L; ZnSO4: 0.01g/L; CuSO4: 0.01g/L; NaNo3: 3.6g/L. The cultures were incubated for seven days at 30ºC and 275rpm in rotary shaker. A mineral medium containing equivalent quantity of glucose in place of the terpenes was used as the control. Kinetic study for growth determination was followed in order to select terpene degrading strains. A total of 9 microorganisms were isolated from decayed citrus fruits from random sampling. Observation of the isolated microorganisms in optical microscope and selective medium allowed us to verify that 6 strains belong to yeast class, 2 strains to bacteria, and one to filamentous fungi. Bacteria were identified as Bacillus gram negative and coccus gram positive by general characteristics of the colonies and Gram staining technique. The selected strain of filamentous fungi was identified as Aspergillus niger by micro-cultivation technique, based on the shape of fructification body. Macro and microscopic aspects, the colouration of upper and lower parts, black conidial heads, mycelium density and based on the presence of hyaline and dark septated mycelium..Table.1 presents the number of microorganisms isolated and their colony characteristics. Table 1: Microorganisms isolated from decayed citrus fruits by Random sampling. Generally, the minimum inhibitory concentration (MIC) of limonene against some bacteria and yeasts are lower than 2%. Although some fungi and bacteria support higher concentrations, in biotransformation, the usual limonene concentration applied varies from 0.2 to 1% . A 1.5% v/v of limonene/alpha pinene is also been applied in resistance screening of microbial isolates . For this reason, the maximum concentration used in the experiments is 1.5%. Since the genera citrus presents a high concentration of monoterpenes, the high number of resistant strains among the ones isolated could be explained [21,26]. The results depicted in Figure 1 shows that, the isolate 24 B1 was found to be resistant to the concentrations of 0.2% v/v to 1.5% v/v of limonene in 48hrs of incubation. The culture took 48hrs to grow at higher concentrations of limonene. 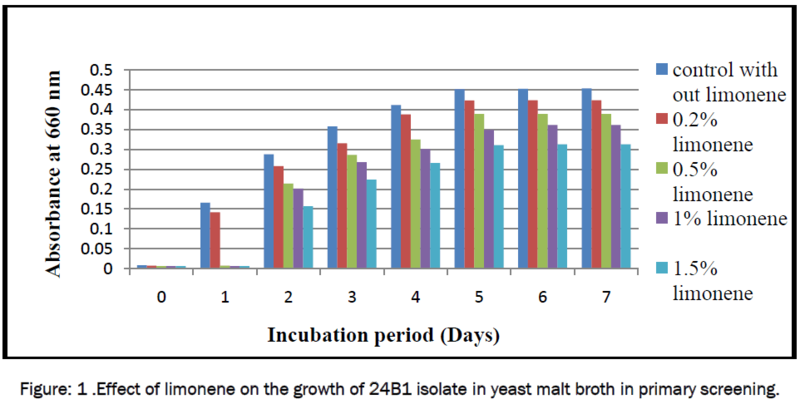 Figure 1: Effect of limonene on the growth of 24B1 isolate in yeast malt broth in primary screening. The isolate 48Y2 was found to be resistant only to 0.2% v/v of limonene in 48hrs of incubation. 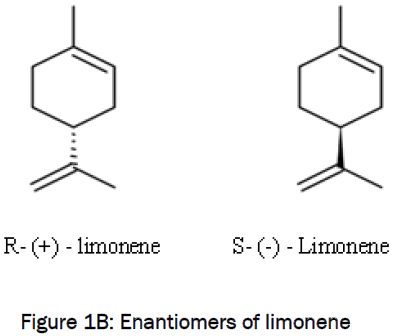 Further raising the limonene concentration at 0.5%, 1% and 1.5% resulted in absence of biomass formation (Fig. 2). The isolate 48Y3 (Fig. 3) was found to be resistant to 0.2% v/v ,0.5%v/v & 1% v/v of limonene in 24hrs of incubation. The growth profiles of 48Y3 were almost stable from day1 after inoculation at 1.5% limonene. Figure 3: Effect of limonene on the growth of 48Y3 isolate in Yeast malt broth in primary Screening. The isolate 2WY1 was found to be resistant only to 0.2% v/v of limonene in 24hrs of incubation at 30°C. Biomass is not formed after inoculation at 0.5%, 1% and 1.5% concentrations of limonene (Fig.4). Figure 4: Effect of limonene on the growth of 2WY1 isolate in yeast malt broth in primary screening. It was observed from Figure 5 that the isolate 2WASP was found to be resistant to 0.2% v/v to 1.5% v/v of limonene in 72 hrs of incubation. Sporulation is significant in control in 48 hrs but the culture took 72hrs to sporulate in the presence of terpenes. Figure 5: Effect of limonene on the growth of 2WASP isolate in yeast malt broth in primary screening. As the above isolates presented good results in the presence of terpenes they were submitted to carbon source study. The microbial resistance to terpenes with added carbon source in primary screening does not guarantee a high biotransformation activity, but it is an essential characteristic to a biotransforming agent. Hence, this step was considered as an important part of the study. In order to find the above microorganisms ability of biotransforming terpenes, the crucial step is to find the resistance screening of the microorganisms that can use terpenes as sole carbon source . This indicates the presence of a substrate-degrading metabolic pathway, which can possibly build up the interesting intermediate products. Proportionally, the recovered strains which are able to use terpenes as sole carbon source appeared to be the most adapted microorganisms. In a medium containing limonene as sole carbon source the best results of biomass production were obtained by the following strains. From the Figure 6 the isolate 24B1 was found to be resistant to 0.2% v/v, 0.5%v/v, 1% v/v of limonene in 24hrs of incubation. With 1.5% v/v limonene almost the growth profiles were stable from day1 after incubating the cultures at 30°C. The isolate 48Y2 was found to be resistant only to 0.2% v/v of limonene in 48 hrs of incubation (Fig. 7). With 0.5%, 1% and 1.5% limonene no growth is observed from day1 after incubating the cultures at 30°C with limonene as sole carbon source. The isolate 2WASP (Fig. 8) was found to be resistant to the concentrations 0.2% v/v to 1.5% v/v of limonene in 72hrs of incubation at 30°C in mineral media with limonene as sole carbon source. In the resistance screening tests of microbial isolates with alpha pinene, the results obtained were seemed to be similar to the microbial isolates response to limonene. The same isolates which were found to be resistant to the limonene concentrations in primary and secondary screening were also found to be resistant to the similar tested concentrations of α-pinene in primary and secondary screening. From figure.9 the best results of microbial growths were obtained by the strains, 24 B1 which is found to be resistant to 1.5% and 1% terpenes in primary and secondary screening respectively, 48Y2 which is found to be resistant to (0.2%) terpenes, in primary and secondary screening, and 2WASP is found to be resistant to 1.5% terpenes in both primary and secondary screening. Conversely 48Y3 and 2WY1 failed to grow in carbon source study. Among the screened strains, (2WASP) Aspergillus niger have already been reported as aroma production microorganism [11,20,28]. Among the nine isolated strains, 24B1, 48Y2, 2WASP showed good potential in carbon source study which predicts their ability to degrade limonene and alpha pinene. From (Fig: 9) it is worth noting that about half of the isolated microorganisms have shown resistance to monoterpene concentrations in primary screening except for the Gram positive cocci (48B1), which appeared to be more sensitive to terpenes, and few yeasts, (48Y1, 120Y 120Y2) that were not able to grow in tested concentrations of terpenes as Yeasts are usually more sensitive to terpenes than bacteria . In the present work even though half of the isolated yeast strains (48Y2, 48Y3, 2WY1) resist to terpene concentrations in primary screening, only one strain (48Y2) has shown growth in medium with the monoterpene as sole carbon source in secondary screening. This lower terpene metabolizing capacity explains the work published on yeasts mediated biotransformation of limonene . Initial physiological studies on shake flask scale were performed to characterize the growth behavior of the cultures in the presence of the respective monoterpenes which made the base for the subsequent investigations of the biotransformations in the bioreactor. From growth curves of all the isolates (Fig’s 1 to 8), difference in the biomass rates and absorbance was observed with cultures in primary and secondary screening. It was also noticed that in cultures with terpene concentrations less biomass is formed than in a control culture (without terpene dosage).Raising the terpene concentration resulted in a steady decrease of cell viability (absorbance) illustrated by the fact that there is a significant effect of terpenes on the growth of the isolates and determines individual isolate’s response to different concentrations of terpenes [31-33]. Despite growing in the medium containing the terpenes tested, few strains in general, needed 24h to 48h more to grow in media containing terpenes when compared to the control medium. It was observed that the isolate 48Y2 has shown growth in 48hrs (fig’s: 2 & 7) at 0.2% terpene. The isolate 2WASP took 72hrs (Fig. 5 & 8) to sporulate profusely at terpene concentrations in both primary and secondary screening. The results obtained in the present work seemed to be noticeable. All the strains showed significant growth during the primary screening step, but presented less growth in the medium containing terpene as sole carbon source in secondary screening. Distinct observation was made with 24B1 isolate, where at 0.5%, 1%, and 1.5% terpenes, growth is observed in 48hrs (Fig.1) in primary screening. However in secondary screening the culture has shown growth in 24h with 0.2%, 0.5% & 1% terpenes, along with control but no growth is detected with 1.5% terpenes (Fig.6). Thus, it is possible to understand the importance of the results obtained from the behavior of microorganisms to terpene concentrations observed during the selection. Several studies have been carried out on screening of terpene resistant strains  and in strain resistance selection, 11 fungi, 3 bacteria, and 1 yeast strain were found to be resistant to (R)-(+)-limonene (1%). Ieda  isolated 193 limonene (1.5%) resistant microorganisms from various sources and were submitted to biotransformation of (-)-α-pinene. Bicas and Pastore  isolation of d- limonene resistant microorganisms from citrus processing plant screened 70 strains which were able to grow in mineral medium containing limonene (1%) as sole carbon source. Biotransformation processes with the selected microorganisms can be further investigated in order to select the best aroma-productive strains. The literature and the present work clearly concludes that the isolation and screening of terpene resistant microorganisms is a crucial part of the study to emerge with novel strains which performs terpenes biotransformation to produce valuable aromatic chemicals. The 24B1, 48Y2 and 2WASP were found to be the best potential isolates showing resistance to 1.5%, 0.2% & 1.5% concentrations of monoterpenes limonene/alpha pinene respectively in primary screening and the above three isolates were resistant to 1%, 0.2% and 1.5% concentrations of monoterpenes repectively in secondary screening. The selected best isolates can further be subjected to biochemical tests to identify and perform the optimization studies with respect to other physiological parameters for their possible exploration at industrial and lab scale production.This work may thus serve as a sound basis and mark a very promising step towards the biotechnological production of valuable natural flavour and fragrances compounds from cheap and abundantly available natural terpenoids. The authors are grateful to Mr. D.B Rao, Director, privi organics ltd; Navi Mumbai who had given opportunity in pursuing research work and Mr. Vijay Kumar, Director, Technical, privi life sciences, for his guidance and insights at various stages of the research work. Chowdary GV, Prapulla SG. The Influence of water activity on the lipase catalyzed synthesis of butyl butyrate by transesterification. Process Biochem. 2002;38:392 – 397. Rossi SC, Vanderberghe LPS, Pereira BMP, Gago FD, Rizzolo JA, Pandey A, Soccol CR, Medeiros ABP. Improving fruity aroma production by fungi in SSF using citric pulp. Food Res Int. 2009: 42, 484-86. Scharpf IG, Seitz EW, Morris AJ, Farbood MI. Generation of Flavor and Odour Compounds through Fermentation Processes. American Chem Soc. 1986: 323-46. Couto SR, Sanroman MA. Application of solid-state fermentation to food industry – A review. J Food Eng. 2006: 76: 291-302. Berger RG. Biotechnology of flavours – the next generation. Biotechnol Lett. 2009: 31:1651-59. Griffin SG, Whyllie SG, Markham JL, Leach DN. The Role of Structure and Molecular Properties of Terpenoids in Determining their Antimicrobial Activity. Flav Fragr J. 1999: 14: 322-32. Aleu J, Collado IG. Biotransformation by Botrytis species. J Mol Catal B Enzym. 2001:13: 77-93. Prema BR, Bhattacharya PK. National chemical laboratory, pune; Microbial Transformation of terpenes, Transformation of Alpha pinene. Appl Microb. 1962: 10: 524-8. Yoo SK, Day DF, Cadwallader KR. Bioconversion of α- and β-Pinene by Pseudomonas sp. Strain PIN. Process Biochem. 2001: 36: 925-32. Patrick JO, Natarajan SS, Weijie Fu. Method for degradation of pinenes by bacillus isolates. US patent: 6344350: 2002. Haribabu L, Peruma S, Balasubramanian MP. Myrtenal attenuates diethylnitrosamine-induced hepatocellular carcinoma in rats by stabilizing intrinsic antioxidants and modulating apoptotic and anti-apoptotic cascades. Cell Oncol (Dordr). 2012: 35:269-83. Chang HC, Oriel PJ. Bioproduction of Perillyl Alcohol and Related Monoterpenes by Isolates of Bacillus stearothermophilus. J Food Sci: 1994: 59: 660-62. Duetz WA, Bouwmeester H, VanBeilen JB, Witholt B. Biotransformation of Limonene by Bacteria, Fungi, Yeasts and Plants. Appl Microbiol Biotechnol. 2003: 61: 269-277. Crowell PL. Prevention and Therapy of Cancer by Dietary Monoterpenes. J Nutr. 1999: 129: 775S-778S. Krings U, Berger RG. Biotechnological Production of Flavours and Fragrances. Appl Microbiol Biotechnol. 1998: 49: 1-8. Shukla OP, Bhattacharya PK. Microbial Transformations of Terpenes. Part XI Pathways of Degradation of alpha & beta Pinenes in a Soil Pseudomonad (PL-Strain). Ind J Biochem. 1968: 5: 92—101. Agrawal R, Joseph R. (2000), Bioconversion of alpha pinene to verbenone by resting cells of Aspergillus niger. App Microbiol Biotechnol. 53:335-337. Ieda Rottava, Priscilla FC, Camila AZ, Rogerio LC, Geciane T, Helen T et al. Microbial Oxidation of (-)-α-pinene to Verbenol Production by Newly Isolated Strains. Appl Biochem Biotechnol. 2010:162:2221–31. Gloria A, Prieto S, Janeth A, Perea V, Claudia C, Ortiz L. Microbial biotransformation of (R)-(+)-limonene by penicillium digitatum DSM 62840 for producing (R)-(+) - terpineol. Vitae Rev De la facul De Quimica Farmaceutica. 2011;18:163-72. Akbar Esmaeili, Abas Khodadadi, Shila Safaiyan. Biotransformation of thymol by Aspergillus niger. Chem Nat Comp. 2012:47: 966-8. Barnett HL, Barry B, Hunter B. 1986. Illustrated genera of imperfect fungi. New York, USA: American Phytopathological Society. Mario CJB, Sabrina P, Vanete TS, Carlos RS, Adriane BPM. Isolation and Screening of Microorganisms with Potential for Biotransformation of Terpenes. Braz Arch Biol Technol. 2011: 54: 1019-26. Bicas JL, Pastore GM. Isolation and Screening of D-Limonene-Resistant Microorganisms. Braz J Microb. 2007: 38: 563-67. Bicas JL, Dionisio AP, Pastore GM. Biooxidation of Terpenes: An Approach for the Flavor Industry Chem Rev. 2009:109: 4518–31. Divyashree MS, George J, Agrawal R. Biotransformation of terpenic substrates by resting cells of Aspergillus niger & Pseudomonas putida isolates. J Food Sci Technol. 2006: 43: 73-76. Subba MS, Soumithri TC, Rao RS. Antimicrobial Action of Citrus Oils. J Food Sci. 1967: 32: 225-27. Van DVK, Rensburg E, Moleleki N. Hydroxylation of (+)-limonene, (−) α-pinene and (−) β-pinene by a Hormonema Sp. Biotechnol Lett. 1998: 20:431–36. Rozenbaum HF, Patitucci ML, Antunes OAC, Pereira Jr N. Production of aromas and fragrances through microbial oxidation of monoterpenes, Braz J Chem Engg. 2006: 23: 273-79. Michael Pescheck, Marco Antonio Mirata, Bianca Brauer, Ulrich Krings, Ralf Gunter Berger, Jens Schrader. Improved monoterpene Biotransformation with Penicillium sp by the use of a Closed gas loop bioreactor. J of Ind Microb Biotechnol. 2009: 36:827–36. Mustafa ÜÜ, Filiz U, Aysun S, Sadk D. Research on antifungal and inhibitory effects of DL-limonene on some yeasts, Turk J Agric For. 2012: 36, 576-82.